L'éruption du volcan au NaBrO se poursuit. La phase explosive semble avoir pris fin, mais il ya encore une grande vapeur blanche et du panache de gaz provenant du volcan et une grande tache chaude est visibe sur les images satellite MODIS / Terra. Très probablement, de grandes coulées de lave sont encore éclaté. Nabro is a stratovolcano at the SE end of the Danakil Alps in Eritrea and is the highest volcano in the Danakil depression. Nabro is a complex volcano with 2 nested calderas of 8 and 15 km diameter, the larger of which is breached to the SW. The stratovolcano consists mainly of trachytic lava flows and tephra layers. Inside the caldera and on its flanks, there are post-caldera rhyolitic obsidian domes and basaltic lava flow. 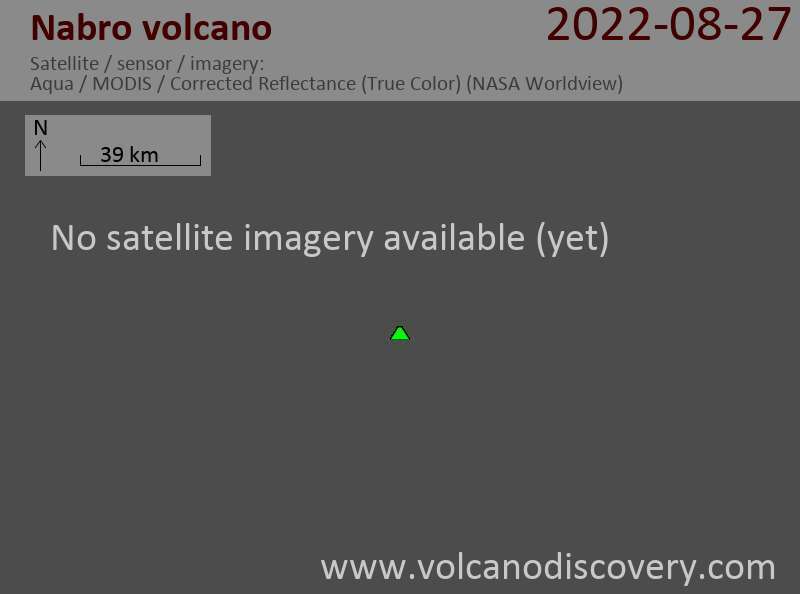 Although not precisely dated, the most recent features are lava flows from NNW-trending fissures transverse to the NE-SW trend of the Nabro volcanic range. Nabro stratovolcano sits on the crystalline basement of the Danakil horst, an isolated segment of the original continental African crust which has been largely dissected and is being pulled apart in the Afar triangle by active oceanic spreading ridges. Nabro is the most prominent and NE-most of a NE-SW chain of 3 large volcanoes (Nabro, Dubbi, Mallahle), each containing a large summit caldera. These 3 volcanoes, along with Sork Ale volcano, collectively form the Bidu volcanic complex. During the late afternoon and evening of June 12 2011 a series of moderate earthquake struck at first near Afambo in Eritrea and later 100 km more to the south in Ethiopia. The swarm was followed by a new explosive eruption at Nabro volcano. The eruption produced a large ash plume that drifted westwards over northern Africa and quickly reached more than 1000 km length. This is the first known historic eruption of Nabro volcano.